Carter & Jasper is a business that is able to make items to your specs. Some items are in stock. If you find something in these pages, you may want to check for availability. We also make a large number of different items that may not be listed (yet), so feel free to inquire. These include frock coats, paletots, "livery jackets", various vest patterns, etc..
We strive to give you the best customer service available and find it necessary to make changes from time to time to assure we are serving you to the best of our ability. 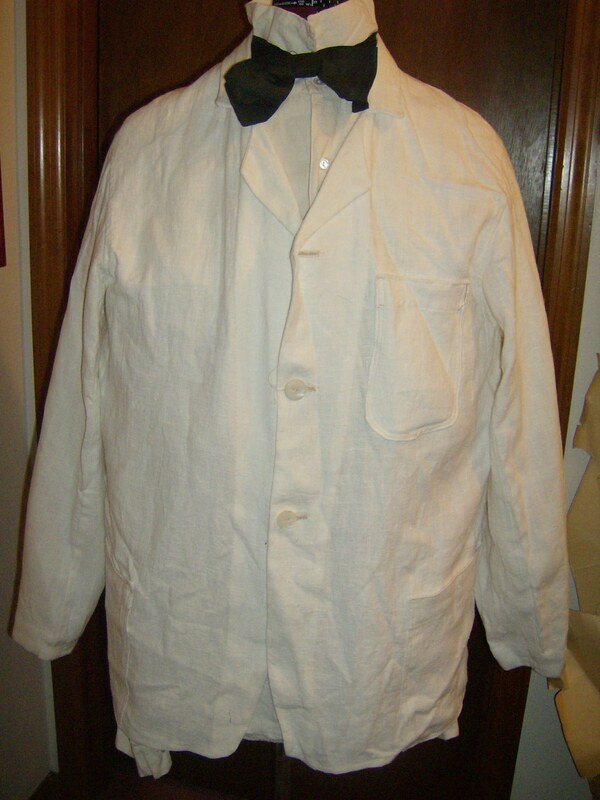 These are generally made of off white linen, but other colors can be used for specific orders. Machine stitched and felled seams. hand worked buttonholes. 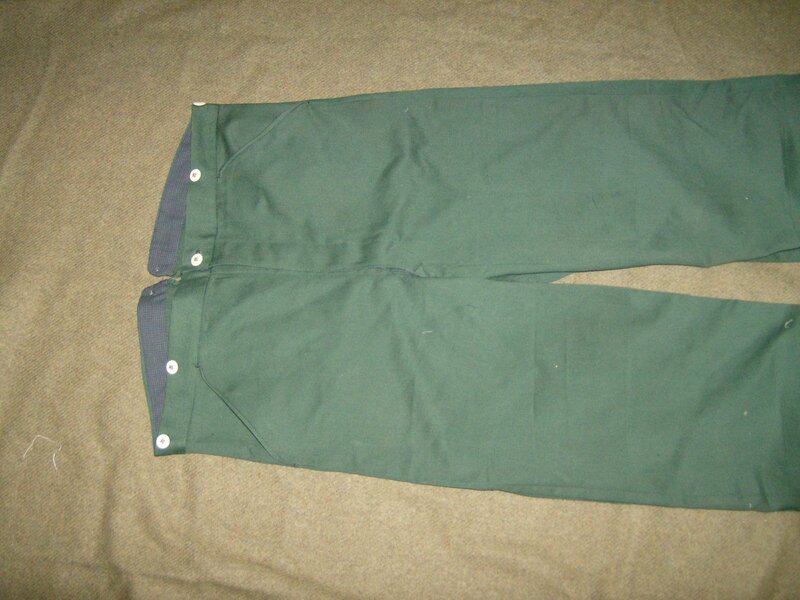 Three external patch pockets. 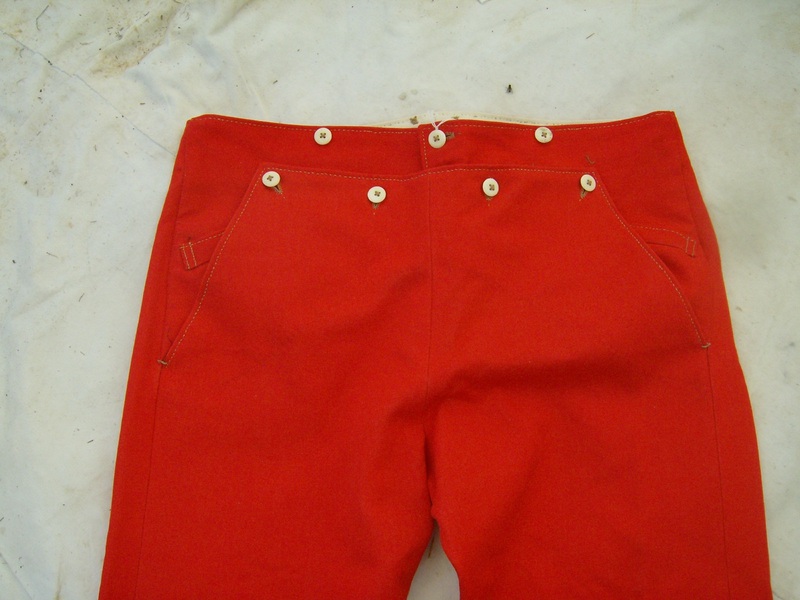 If you are wanting something more customized, hand-felled seams, etc., this can be done. Please contact for pricing. Woolen Sack Coats are also available (no photos yet). 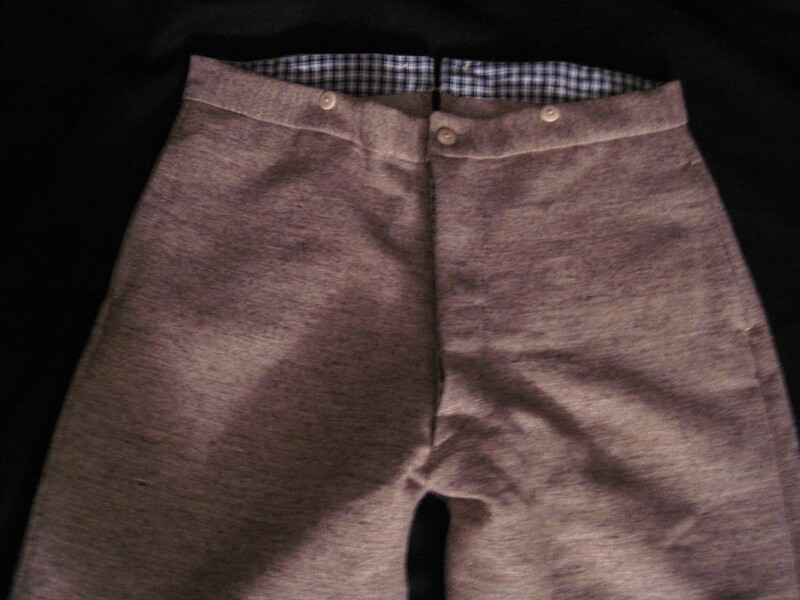 These are medium weight wools, lined in cotton and 3 exterior and one interior pocket. All machine sewn with hand worked buttonholes and proper finishing. For custom orders, please contact for any price changes, etc. 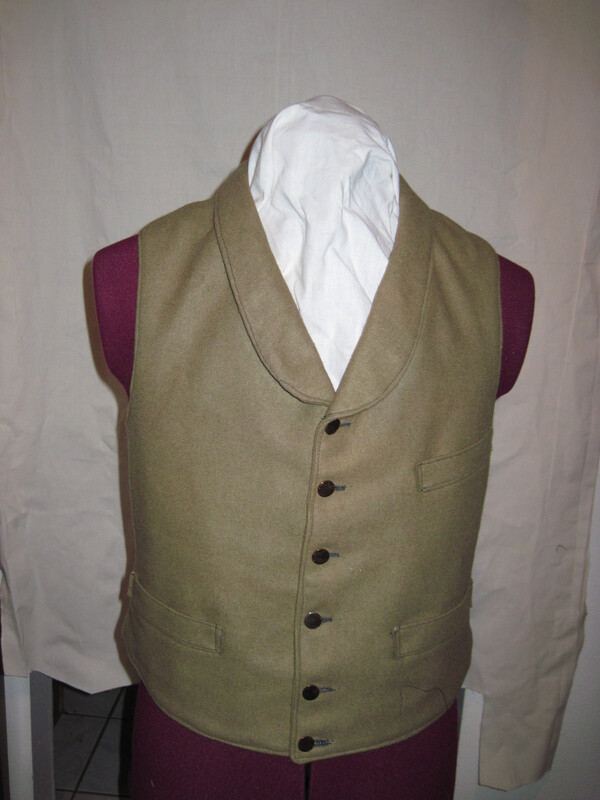 Military style vest with standing collar and nine button front. 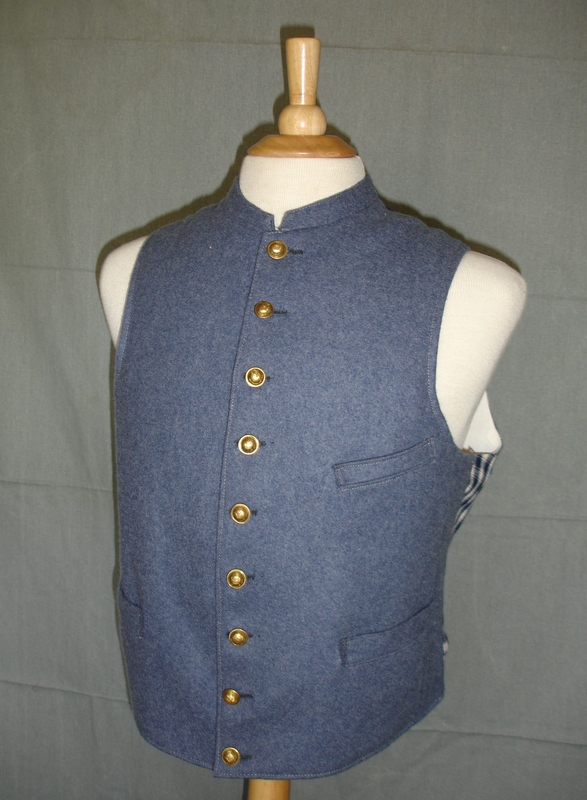 Vest fronts are cut from wool or jean cloth and constructed with three pockets. Hand worked buttonholes. 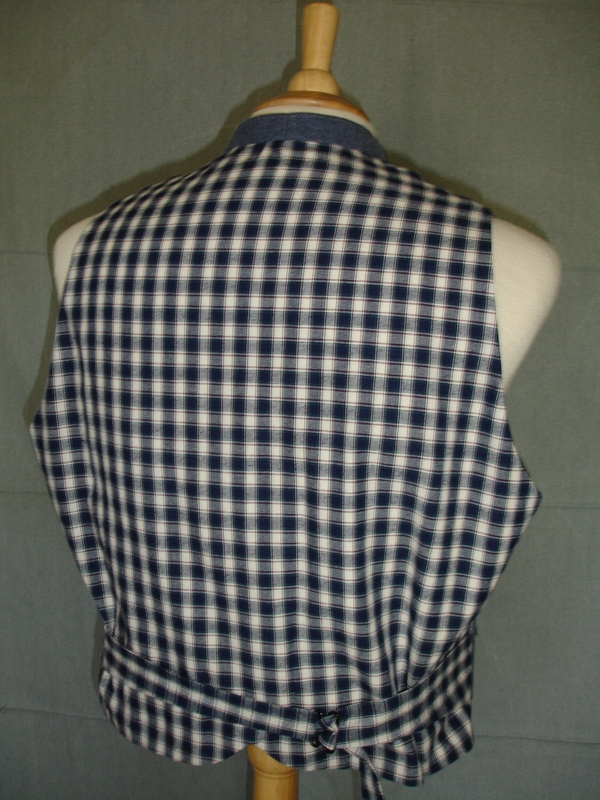 Vest back of black (or other polished cotton) and adjusting with buckle and strap (Shown is a custom piece with heavy cotton shirting. Colors include dark blue, sky blue, cadet grey, blue grey and various jeans. Sizes 38-50.. Single breasted shawl collar vest. 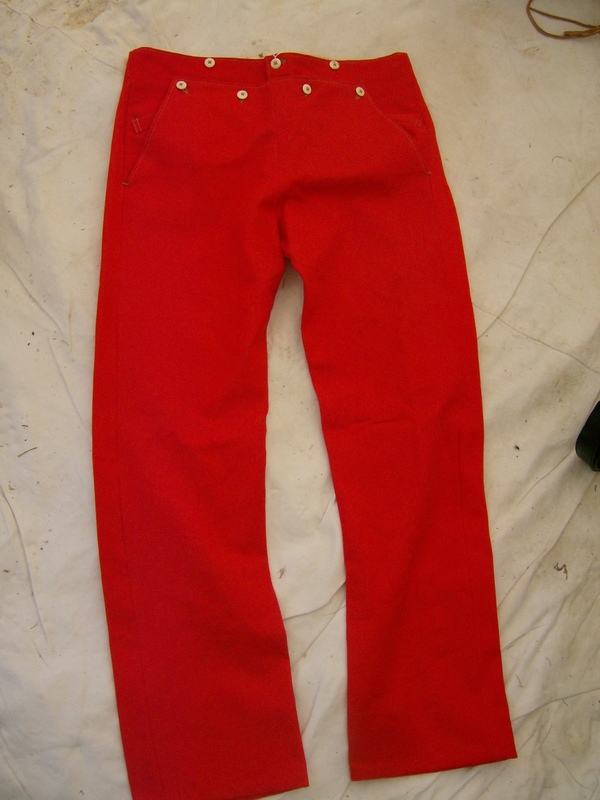 These can be made of various fabrics: wool, cordouroy, jean-cloth, linen or cotton. Sizes 38- 48. 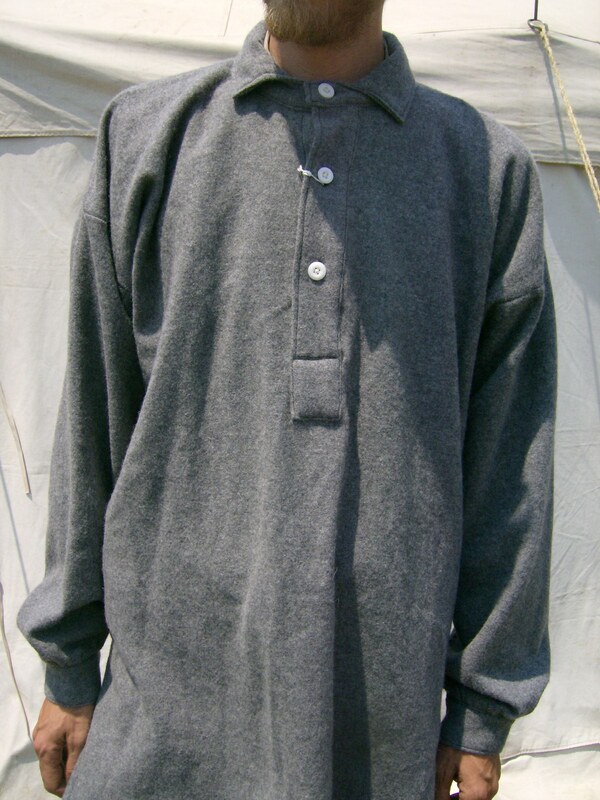 Wool overshirts. Great item for when you need to do some work on the farm or in the shop, use for a militia "uniform" or just need some extra warmth. 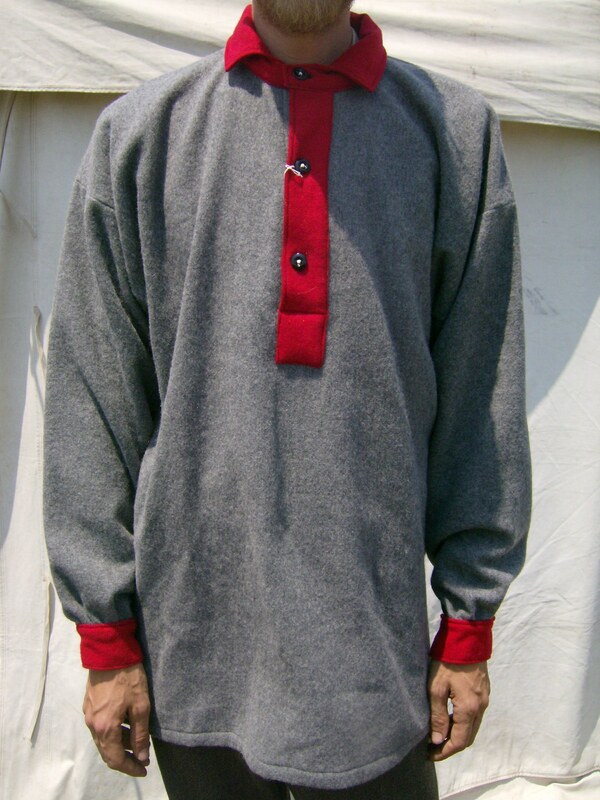 Made of grey, blue, red or brown wool flannel with button closures. Shown are are variations. Pockets, extra trimming are an additional fee. Please contact us for details. 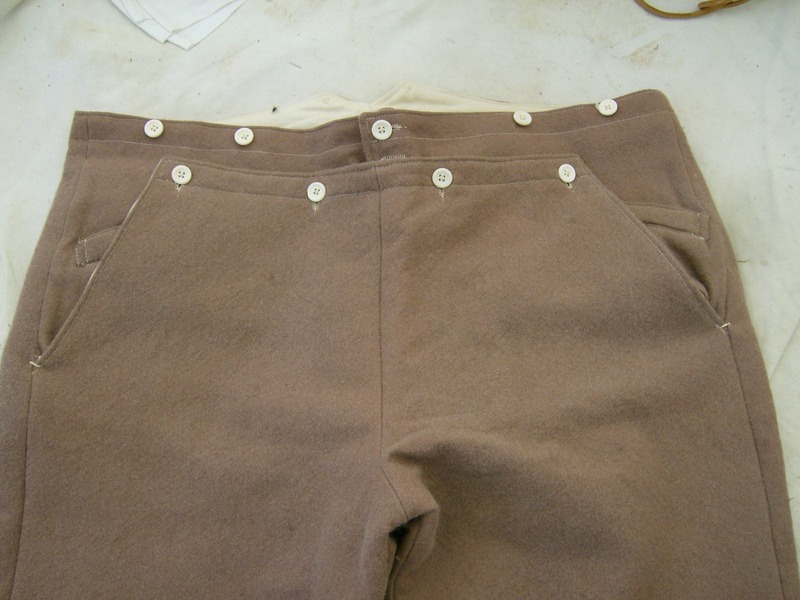 These are common broadfall trousers, as seen in tailoring books during the mid-19th century. 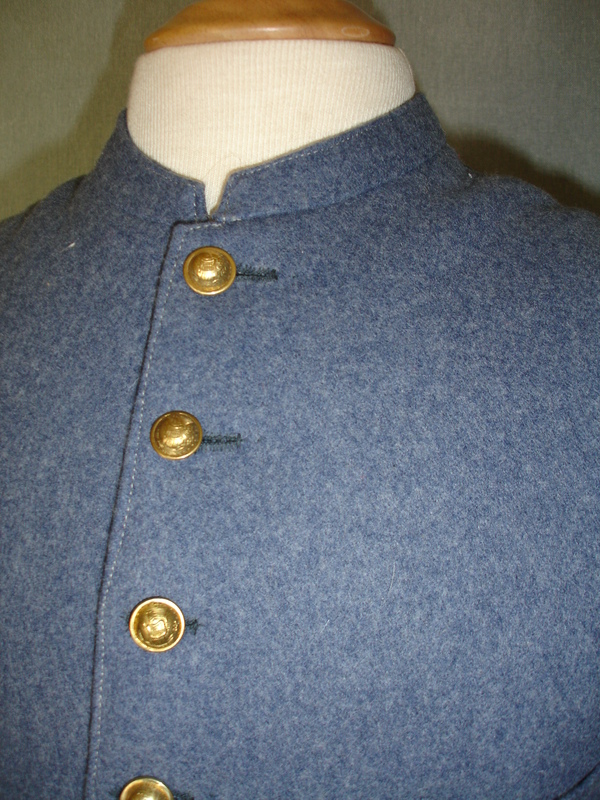 Bone button closures and top entry pockets under the "flap". 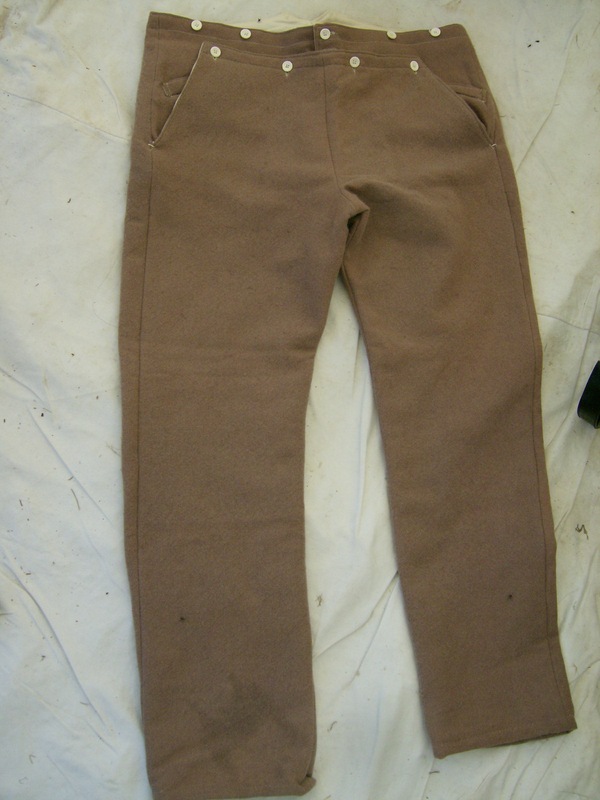 Brown home-dyed wool jean. Machine topstitched, hand done buttonholes. Red wool satinette. Hand topstitched and buttonholes. 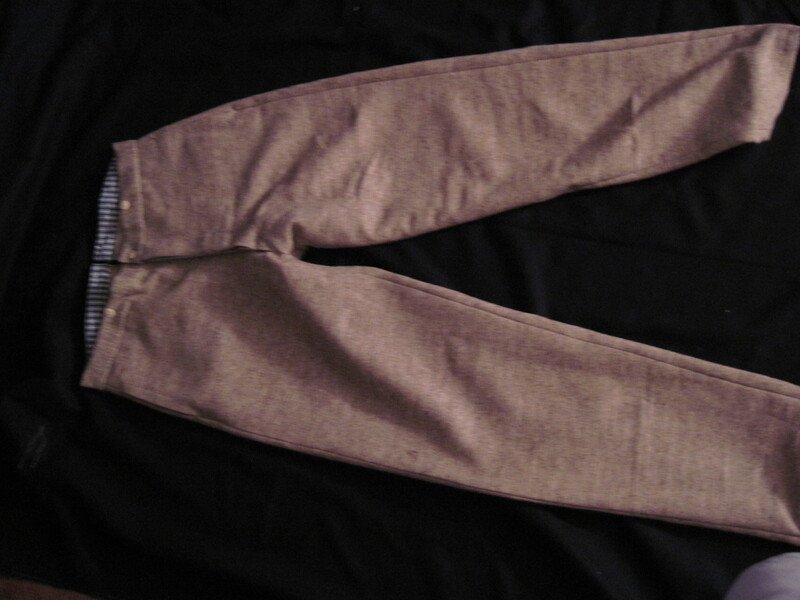 Grey wool jean trousers. 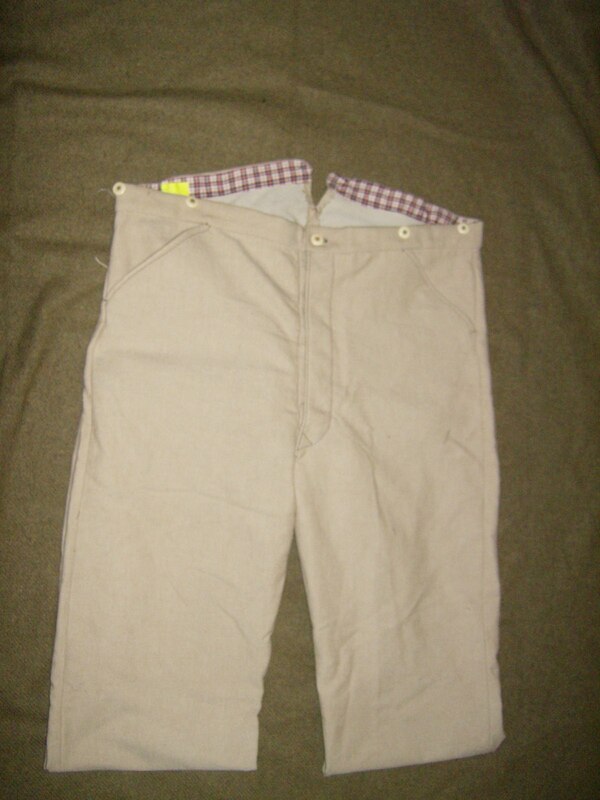 These are medium weight with side seam pockets. 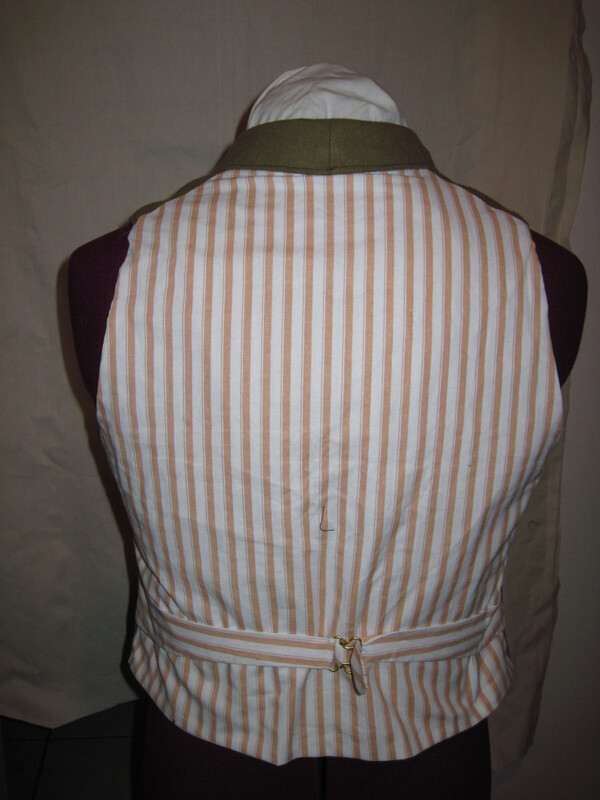 Bone buttons and belt back adjustor. There is a good deal of hand topstitching.